Since most of the books I read lately are from my library's collection, I read a lot of middle grade and young adult fiction, and I enjoy it. A parent (who is also a teacher) came in this morning to ask about a book her daughter just checked out. She named it and asked if I had read it. I did and I liked it and I was able to assuage her concerns that there was anything inappropriate in the book. Difficult situations (a single, working class father who doesn't know how to relate to his autistic daughter and vice versa), yes, but that's it. What it also means is that a lot of dystopian fiction makes its way across my desk. The good news is that I like dystopian fiction. The Giver is still my favorite book ever. However, I am well aware of dystopian fiction's oversaturation of the market right now and I am not going to waste my time on something that isn't good. So, when I decided to start reading The Testing series by Joelle Charbonneau, my guard was up. It had all the hallmarks of a popular dystopian series - female protagonist, trilogy, disturbing rites of passage into adulthood. However, the first book is a Virginia Reader's Choice for High level grades this year, so I figured someone had decided it wasn't terrible. I'd ordered it for the library, so I picked it up off the shelves and started reading. I have decided that I have made the right choice. Yes, it contains some tropes, but others are refreshingly absent. I'm quite pleased by the fact there is a love interest, but no triangle, and the love our main character, Malencia, has for the boy from her hometown is not really a driving force in the story. It affects certain choices, of course, but does not drive her to action in general. I also appreciated the lack of moping or whining. Is she sad at times? Yes. But she doesn't go on and on about it for pages on end. Cia is a very decisive character, and this is another way she shows it. 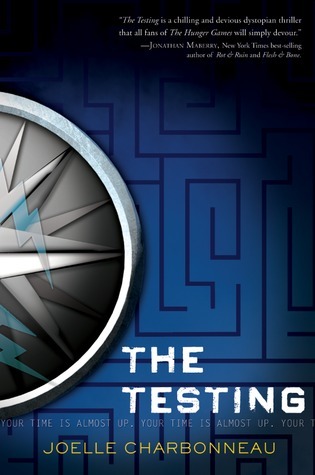 One person I talked to about it said that The Testing is The Hunger Games for people who don't want to think. I don't necessarily agree with that. Yes, Cia explains everything she's doing and why, but that's okay with me. This is her story after all. I still managed to have things to think about. Overall, having read the entire trilogy, I liked it and would recommend it to others who enjoy dystopian fiction. Another dystopian fiction trilogy I like is the Matched trilogy by Ally Condie. It's a world in which there is very little personal choice. Everything is decided for you by the system, based on algorithms and calculations. It reminded me a lot of what I understand as Satan's plan for the children of God - don't give them the choice to do anything other than follow Heavenly Father and everyone will return home to heaven. Turns out that Ally Condie is Mormon, so this might have been exactly what she was going for. As such, I engaged with this series in a different way than someone else might who is not Mormon, but I've recommended it to some of my students and they enjoyed it anyway. What are you reading lately? Anything I should read? It doesn't have to be dystopian!